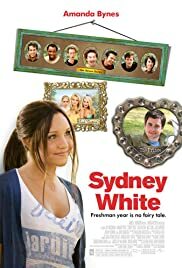 Sydney White: I'm sorry, I'm still learning to speak priss. I found this simple tale charming and entertaining. It was funny without filth. The cinematography was quite lovely in many spots. It was fun to see John Schneider in a mature role for the first time in a long while. I feel that Amanda is a lovely, talented young girl who did a good job with the role. All the geeks were comical and interesting in their own individual ways. The facial expressions of George were absolutely endearing and evoked hilarious laughter several times. I found myself wanting to bring them all home for a good meal! I especially liked the excellent life-lesson shown for all of our society and wholeheartedly recommend this film for everyone over the age of 12. Younger kids just won't get it nor enjoy it.